Bathroom | How can I recycle this? How can I repair or restore an old bath? I have recently designed and restored a cast iron roll top bath. I’ve taken an antique original bath and I have recently designed and restored a cast iron roll top bath. 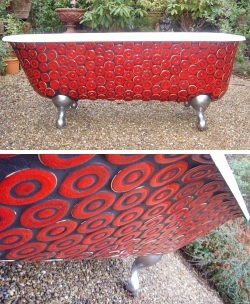 I’ve taken an antique original bath and have given it a bespoke twist using ceramic handmade mosaics as decoration. With the iron legs chromed too I feel it would stand out in any bathroom. Replica cast iron baths take large amounts of energy to produce and thus leave a large carbon foot print. This is my greener alternative! This is a great idea – there are so many old baths dumped because they’re no longer pretty but this now is pretty flash. 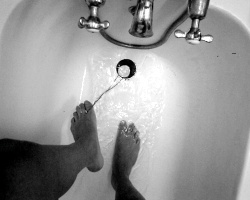 Our bath in our last house was very old – the original one when bathrooms were installed in the houses in the 1960s (when the council decided that the 60 year old houses weren’t actually “temporary housing” as planned) – and as a result, the enamel was damaged & stained by water deposits. It was always our plan to explore re-enamelling it but as with many things in our lives, we never got around to it. Has anyone else had any experience re-surfacing a bath? Did you do it yourself or is it a job for a professional? A lot of baths nowadays seem to be made from plastic or fibreglass – not quite so cold but more prone to cracking that a solid hunk of metal. Has anyone fixed a damaged plastic/fibreglass bath? How can I reduce my use of disposable bathroom supplies? Following on from last week’s “Reduce This” post about cutting back on toiletries, I’d really love to hear how other people are reducing their use of related bathroom consumables, such as toilet paper, cotton wool and the like. A number of bloggers and other people around the old worldwide web have been taking part in Crunchy Chicken’s Cloth Wipe Challenge 2009 over the last couple of weeks – giving up toilet paper for a month (and hopefully beyond). I think it’s a great idea and intend to give it a go as soon as we get a bit more settled here in our new home – I’ll probably start with just wee wipes and perhaps build it up from there. Will be interesting to see how much less paper we use as a result. Has anyone else tried that? There are lots of great suggestions on Crunchy Chicken’s blog for sourcing cloths (it’s super easy to make them out of soft old tshirts) and containers to keep them in before washing – anyone got anything to add? 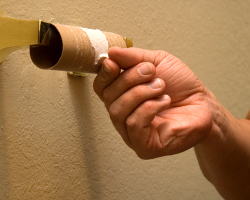 Aside from moving onto cloth wipes, what else can be done to reduce the amount of toilet paper used? Any good tricks for ensuring that kids don’t get paper-happy and only use what they need? Another thing that is much discussed elsewhere is the use of mooncups/divacups and/or reusable sanitary towels instead of disposable towels and tampons – anyone had experience of those? Or other alternatives? I tried to cut back the amount of cotton wool I use for skincare by making washable pads a similar size to the cotton wool pads I already use. I read somewhere (but unfortunately can’t find the article now) that babies’ nappies/diapers are perfect for such a function because they’re soft and absorbent but I’ve had problems getting them clean – I was washing them in little net bags to stop the two-dozen tiny pads disappearing throughout the laundry load and the oily make-up and cleansing goop just would not shift. I’d rather not resort to bleaching them but will try some different cleaning methods over the next few batches (I suspect vinegar will feature prominently). Anyone done anything similar? 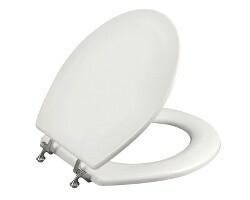 What about other similar bathroom items? What have you done to cutback/reduce waste? 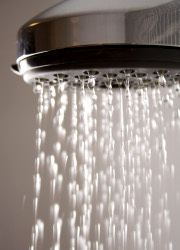 How can I reduce the amount of time I spend in the lovely, hot shower? I need help to get out of the shower quicker – I take long hot showers that actually use more water than a bath would, just because it’s so nice in there. Costs a fortune in gas bills! Thanks to our then-broken boiler, our shower used to go icy cold after a couple of minutes – even though we knew it would get warm again eventually (usually after another minute or so), it was enough to get us out – no will power required. Is there something you can attach to boilers/showers that can mimic that?